2018 Ohio Valley Bank 4-H Scholars (L-R): Megan Adkins, Cabell County; Rachel Kesterson, Meigs County; Grace Martin, Gallia County; Kate Henderson, Mason County; and Kira Mullins, Jackson County. Not pictured is Kalesie Henderson of Pike County. 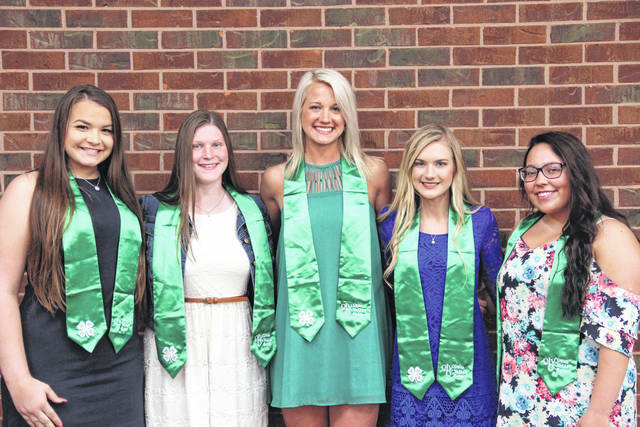 POMEROY, Ohio — Rachel Kesterson, Kira Mullins, Kalesie Henderson, Grace Martin, Kate Henderson, and Megan Adkins were named the recipients of the 2018 Ohio Valley Bank 4-H Scholarship. To date, the bank has helped 223 4-H members pay for college through the program. Rachel Kesterson of Pomeroy, Ohio, was named the Meigs County Scholar. She is the daughter of Randy and Carolyn Kesterson and a member of Busy Beavers 4-H Club. She will graduate from Meigs High School this spring and plans to attend Wilmington College to study sports medicine. Kira Mullins of Jackson, Ohio, was named the Jackson County scholar. She is the daughter of James and Dawn Mullins and a member of Country Classics 4-H Club. She will graduate from Jackson High School this spring and plans to attend Ohio Northern University to study political science. Kalesie Henderson of Piketon, Ohio, was named the Pike County Scholar. She is the daughter of Marvin and Tina Henderson and a member of Westside Hillbillys 4-H Club. She will graduate from Piketon High School this spring and plans to attend Marshall University to study physical therapy. Grace Martin of Gallipolis, Ohio, was named the Gallia County Scholar. She is the daughter of Leanna and Rick Martin and a member of Triangle 4-H Club. She will graduate from Gallia Academy High School this spring and plans to attend West Virginia State University to study criminal justice. Kate Henderson of Henderson, W.Va., was named the Mason County scholar. She is the daughter of Jim and Andrea Henderson and a member of Kountry Kritters 4-H Club. She will graduate from Point Pleasant High School this spring and plans to attend West Virginia University to study neonatal nursing. Megan Adkins of Ona, W.Va., was named the Cabell County scholar. She is the daughter of Mike and Della Adkins and a member of Ona Rainbow 4-H Club. She will graduate from Cabell Midland High School this spring and plans to attend Marshall University to study business. Created in 1986, for over 30 years the Ohio Valley Bank 4-H Scholarship Program has recognized outstanding high school seniors for their accomplishments in 4-H. Recipients receive $3,000 over 4 years which is presented to them during the county fair. Winners are determined by 4-H advisors and volunteers. 4-H involvement accounts for 50 percent of the decision. The other half considers the individual’s experiences in other groups and activities, academic accomplishments and potential for success. Ohio Valley Bank, established in 1872 and based in Gallipolis, operates 19 offices throughout southern Ohio and western West Virginia, in each of the counties in which 4-H scholars are named. The company is a subsidiary of Ohio Valley Banc Corp. whose stock is traded on The NASDAQ Global Market under the symbol OVBC. The company’s website is www.ovbc.com.